We are fortunate to be spending some time with our family in Cary this week. Kristen and Michael receive a CSA box regularly with all that is in season from the local farmers. The above photo shows some of the fruits and vegetables that were in last week’s box. They received fresh blueberries, peaches, heirloom cherry tomatoes, two small watermelons, fresh sweet corn, cucumbers and sweet onions. Kristen made two salsas to go with our freshly caught (cornmeal dusted) grouper. The first one was a watermelon and blueberry salsa that also incorporated the cherry tomatoes. 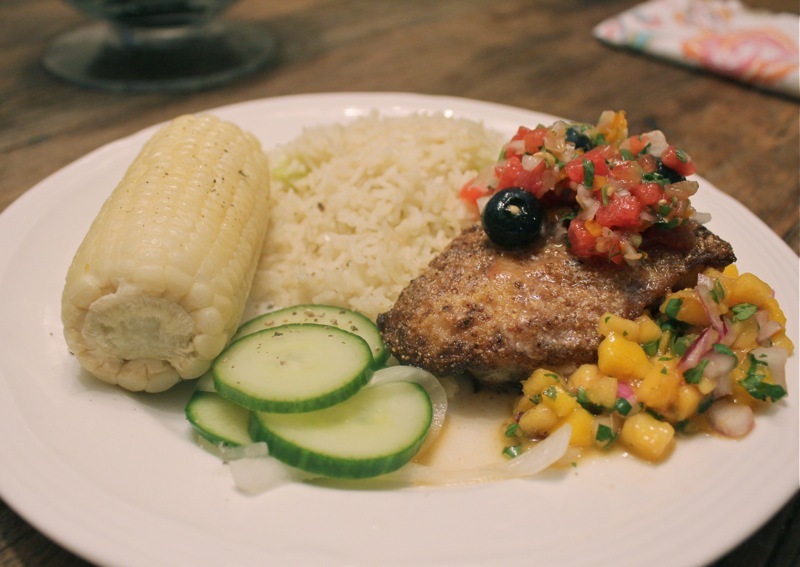 The second one was a peach and mango salsa with a bit of heat from a jalapeno pepper. When asked which was our favorite, none of us could declare either one the winner. That was because both were winners in their own way. Not only is Kristen a great cook, but her brother David (as in “restaurant chef”) came to dinner also and offered great tips on how to cook the grouper properly. It was cooked to perfection with a light dusting of cornmeal before being fried on one side, flipped and finished in the oven. 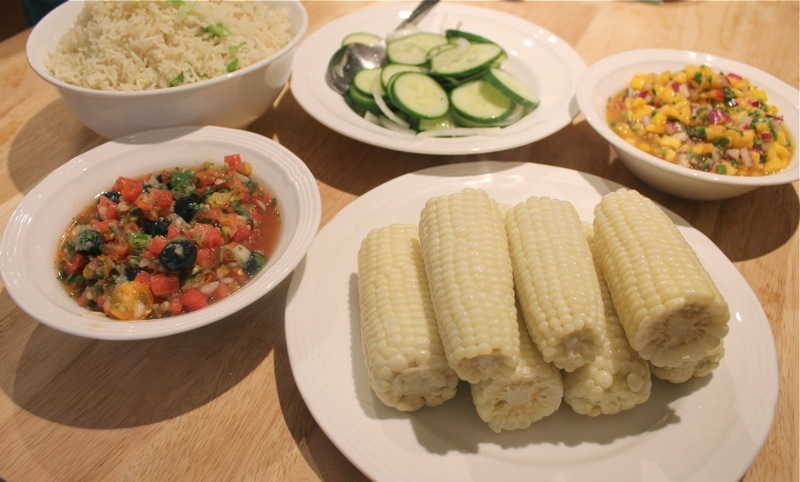 What a beautiful plate of food with all of the bounty of summer upon it. Enjoy these salsas with any of your favorite main courses. *combine all ingredients in a bowl and let sit at room temperature or in the refrigerator for about 30 minutes before serving. Posted on July 19, 2013 at 9:23 am.